KOLKATA: From reckless driving and vehicles randomly changing lanes to errant autos carrying excess passengers — the problems ailing VIP Road are back in focus after two back-to-back fatal accidents on consecutive days, one involving a bus on Monday and the other involving an app cab and truck on Tuesday. Following Tuesday morning’s accident, where an app cab driver was killed and his passenger was severely injured in a car-truck collision when both the vehicles were trying to change lanes, TOI drove along VIP Road to find out the problem points at the major crossings on the stretch. 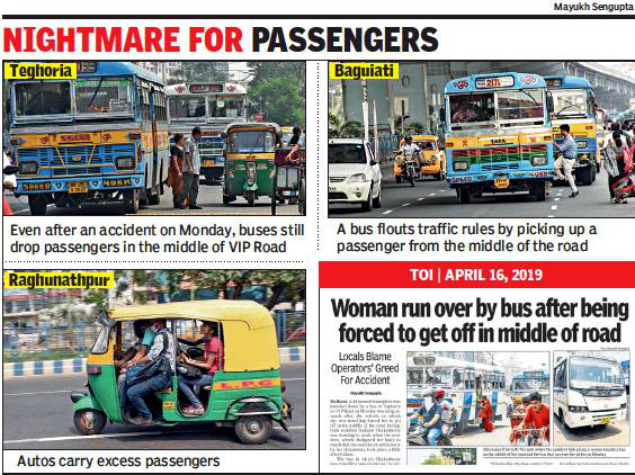 At Teghoria, where a 49-year-old caregiver was run over by a speeding bus on Monday morning seconds after the private bus in which she was travelling forced her to get off on the road, TOI found buses still continuing to drop passengers in the middle of the road forcing them to dodge past incoming traffic. No cops were seen booking any of the buses. Both pedestrian indiscipline and rash driving have been responsible for deaths on the VIP Road stretch. This corridor sees vehicles travelling at higher speeds than in the rest of the city and traffic planning needs to keep that in mind. There are subways, pedestrian bridges and dividers but their number may be inadequate, given the population boom in several areas along the road. “This is one of those stretches on VIP Road where buses overtake each other on their way to airport. But in the process, passengers are left at risk,” said Swapan Chakraborty, an elderly passenger. At Keshtopur, where the road suddenly widens after a recent expansion, buses and other vehicles change lanes at will, posing danger to other vehicles. In November last year, a bus and auto had changed lanes leading to collision that had severely injured the auto driver and left his three-wheeler in a mangled mess. “Such accidents are common on this stretch mainly because of lack of policing,” said Abhinaba Dey, a biker who regularly drives along the stretch. At Raghunathpur, most of the autos carry excess passengers in broad daylight. Cops say they are aware of the problem and undertake surprise drives against such autos. Moreover, the autos are supposed to take the service lane of VIP Road, but the rule is often flouted near Raghunathpur bus stand. At Baguiati, too, cars, autos, buses and rickshaws flout rules as they jostle for space. Buses and autos drop passengers in the middle of VIP Road instead of designated bus stops. Passengers too wait for buses in the middle of the road. “This problem plagues the stretch below Keshtopur flyover. We have plans to undertake counselling sessions for bus and auto drivers,” said an officer.